This product is a unique blend of many nutrients and herbs which can help lipotropic and thermogenic activities in the body. It also binds some fat from food and expels it out. This product is a unique blend of many nutrients and herbs which can help lipotropic and thermogenic activities in the body. It also binds some fat from food and expels it out. Please take fat soluble Vitamins (A, D, E, K) at least 3 hours before or after taking this product. For adults, take 4 capsules each time with one glass of water within 30 minutes before 2 larger meals. (If your 2 larger meals are breakfast and dinner, then take 4 capsules 30 minutes before breakfast and 4 capsules 30 minutes before dinner). Do not use if you are pregnant, nursing or having existing illness. Always consult with health practitioners when you start to take supplements for a dieting program. Store in a dry, cool place. Keep out of the reach of children and not intended for use by those under 18 years of age. This formula has been formulated by Certified Nutritional Specialist and a doctor of Oriental Medicine. This New formula combines many of the most effective and safe lipotropic and thermogenic ingredients in modern nutritional research and Chinese herbology for weight control. It is designed to decreases fat absorption from food and increase the fat metabolic rate within the body and to maintain, or increase, the muscle mass so it can further promote fat burning and body strength. It also helps reduce the “bad cholesterol” level from food intake and within the body, thus protecting the heart and blood vessels. It also contain ingredients which will prevent excess calories from food transferring into fat storage. It is safe, natural and health promoting! That is why it is called Healthy Fat Burners. It is not like many weight-loss products on the market which can reduce energy levels, or cause loss of muscle mass together with fat loss or dehydration caused by laxative teas. Some products can also cause malnutrition if taken over a long period of time. Many diet plans will temporarily work but will slow down the body fat-burning metabolism and are doomed to fail in the long run. 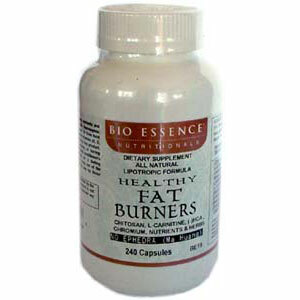 Bio Essence Nutritionals has put out this Healthy Fat Burners product that works in many ways to help you achieve maximum goal in your weight-loss program. A unique blend of Special Nutritionals, Botanicals, Vitamins and Minerals. Chitosan, L-Carnitine Fumarate, Inositol, L-Methionine, Vitamin C, Calcium Pantothenate, Calcium pyruvate, Vitamin B6(Pyridoxine HCL), Chromium (Piconinate), L-Tyrosine. Garcinia cambogia , Citrus aurantium & Green Teat extract, Spirulina, Atractylodes, Kelp, Astragalus, American Ginseng, Cinnamon, Rhubarb & Siler extracts. Chitosan: Contains Amino-polysaccharides which can bind up to 80 times of its weight of fats and cholesterol and is expelled it from the body through bowel movement. Chitosan can be beneficial to the good “flora” in the intestine. Our Chitosan areextracted and purified from Norwegian & USA Lobster shell and Crab shell. Lipotropics: They can break down the fat from normal fat cells to burn in muscle and brown fat tissue or to expel them out. L-Carnitine: It helps move that fat from fat cells to mitochondria to burn, also helps control blood-sugar level and helps strengthen cardiovascular system. L-Methionine: It is also an antioxidant that helps eliminate fatty substances which build up in the arteries cardiovascular disease. Inositol: It moves fat out from the liver and regulates cholesterol level and possibly protects against cardiovascular disease. Calcium Pyruvate: Calcium Pyruvate has two benefits to humans: It can increase energy level and enhance fat loss. The scientists at the University of Pittsburgh Medical Center discovered that dietary supplementation with pyruvate increased fat loss up to 48% and minimized the associated loss of body protein. Pyruvate is 100% safe; it naturally occurs in the body as an end-product of the metabolism of carbohydrates. Chromium Picolinate: It is the most easily absorbed form of mineral for the body to use. This mineral can help metabolize sugar and regulate insulin level. It can increase cells’ sensitivity to insulin and this improve the fluctuation of blood-sugar level. It has been reported to lower cholesterol and triglycerides too. It also promotes fat-burning and it is seen as a ‘fat-buster’ when use with L-Carnitine. 90% people lack this mineral. Spirulina: This is a high nutritional food providing protein and trace minerals. Thermogenic Botanical extracts: Help generate heat from fat-burning and increase metabolism and energy. Garcinia Cambogia Extract: Contians 50% (-) Hydozy Citric acid which can prevent extra calories from the food turning into fat, converting them instead into energy. It also suppresses sugar-craving and it mildly reduces appetite. Green Tea Extract: Cotnians Catechins that rpromote fat-burning. It is also a strong antioxidant to protect blood vessels. Immature Citrus Aurantium Extract: Contains synephine which will bind the blocks that prevent the thermogenic process. It has similar effects as Epherdra fromMa Huang but it sade and without the side effects of MaHuang. It also helps easier bowel wlimination of fat. Astragalus root: It enhances energy and fat metabolism and expels excess water. Atractylodes Lancea Extract: It expels excess fluids from the tissues and promotes fat burning. Kelp Extract: It improves thyroid function and helps fat-burning. Cinnamon, Rhubarb & Siler Extract: A small quantity of these herbs are added to enhance fat burning and leads the ingredients to the body surface. Rhubarb help promote the regulation of bowel movement and circulation. During dieting and lipotropic activity, one needs extra amount of vitamins: B6, Vitamin C, Calcium Panthothenate. The above ingredients work synergistically to greatly promote fat-burning while maintaining you cardiovascular and over-all health of your body. It s a safe and effective formula. For adults, take 4 capsules two times a day about half an hour before the two larger meals with one glass of room temperature or warm water. Avoid taking this product if you are pregnant, nursing a baby (your baby or fetus do not need to lose weight) Keep out of reach of children. A good weight-reducing program involves a balanced diet which contains enough protein (ideally more from beans, fish, egg whites, and less from red meats), carbohydrates in starch form rich in fibers (unrefined grain flour). The protein/carbohydrates ration should be at 0.6-1.0 ration and a lot more vegetables and fresh fruit. You should have very little processed food which contains sugar and fructose. Avoid or decrease food-intake containing most saturated fats, such as butter, margarine, cookies, desserts, French fries, whole fat milk, creamy soups and ice cream. Use food or oil rich in mono-unsaturated fats (such as olive oil) instead. Drink eight glasses of clean water (room temperature or warm) during the day, expecially half an hour or one hour before each meal. Take water or drinks without ice since low temperature drinks will slow down the activity of food-digestion in the stomach. Moderate exercise every day will enhance the thermogenic (fat-burning) process, and the strengthening of muscle tissue will certainly burn the fat as fuel.